We’re a couple of weeks into the new school year by now and I hope that for most of you the morning drop-offs have gotten a bit easier than they were in the beginning. But some of you may still be struggling with a child who doesn’t want to go to school, who resists you leaving at drop-0ff time, and who might be suddenly suffering from stomachaches and headaches (particularly on Sunday nights or weekday mornings) that had not previously been a problem. Today’s interview with Dr. Jonathan Dalton, director of the Center for Anxiety and Behavioral Change in Rockville, MD is going to help us understand whether our child is having a ‘normal’ amount of difficulty transitioning to school or if they are struggling enough that they might need extra help – and if so, what to do about it. Bergin, C., & Bergin, D. (2009). Attachment in the classroom. Educational Psychology Review 21, 141-170. Dalton, J., & Beacon, V. (2018). 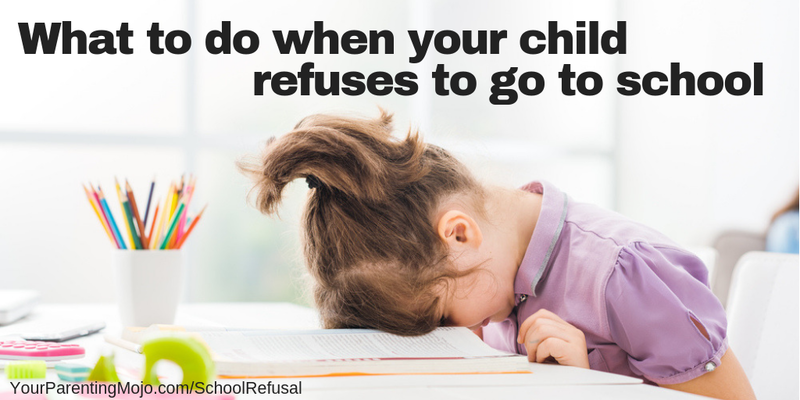 School refusal. In D. Driver & S.S. Thomas (Eds. ), Complex disorders in pediatric psychiatry: A clinician’s guide (pp 11-22). St. Louis, MO: Elsevier. Egger, H.L., Costello, J., & Angold, A. (2003). School refusal and psychiatric disorders: A community study. Journal of the American Academy of Child & Adolescent Psychiatry 42(7), 797-807. Hallinan, M.T. (2008). Teacher influences on students’ attachment to school. Sociology of Education 81, 271-283. Hamre, B.K., & Pianta, R.C. (2001). Early teacher-child relationships and the trajectory of children’s school outcomes through eighth grade. Child Development 72(2), 625-638. Houts, R.M., Caspi, A., Pianta, R.C., Arseneault, L., & Moffitt, T.E. (2010) The challenging pupil in the classroom: The effect of the child on the teacher. Psychological Science 21(12), 1802-1810. Jerome, E.M., Hamre, B.K., & Pianta, R.C. (2009). Teacher-child relationships from kindergarten to sixth grade: Early childhood predictors of teacher-perceived conflict and closeness. Social Development 18(4), 915-945. Kearney, C.A. (2016). Managing school-based absenteeism at multiple tiers: An evidence-based and practical guide for professionals. Oxford, U.K.: Oxford University Press. Kearney, C.A., & Albano, A.M. (2007). When children refuse school: A cognitive-behavioral therapy approach, Therapist guide (2nd Ed.). Oxford, U.K.: Oxford University Press. Kearney, C.A. (2006). Dealing with school refusal behavior: A primer for family physicians. Family Practice 55(8), 685-692. Kearney, C.A. (2002). Identifying the function of school refusal behavior: A revision of the school refusal assessment scale. Journal of Psychopathology and Behavioral Assessment 24(4), 235-245. King, N., Tonge, B.J., Heyne, D., & Ollendick, T.H. (2000). Research on the cognitive-behavioral treatment of school refusal: A review and recommendations. Clinical Psychology Review 20(4), 495-507. Ladd, G.W., & Dinella, L.M. (2009). Continuity and change in early school engagement: Predictive of children’s achievement trajectories from first to eighth grade? Journal of Educational Psychology 101(1), 190-206. Ladd, G.W., & Buhs, E.S., & Seid, M. (2000). Children’s initial sentiments about kindergarten: Is school liking an antecedent of early classroom participation and achievement? Merrill-Palmer Quarterly 46(2), 255-279. Last, C. G., Hansen, C., & Franco, N. (1998). Cognitive-behavioral treatment of school phobia. Journal of the American Academy of Child and Adolescent Psychiatry 37, 404–411. Jen: 00:01:24 To help us understand this and figure out what to do about it, we’re here today with Dr Jonathan Dalton, who is a licensed psychologist and the Director of the Center for Anxiety and Behavioral change in Rockville, Maryland. He received his BA in psychology from Villanova University an MA in psychology from the Catholic University of America and this PhD in Clinical Psychology from Fordham University. Dr Dalton specializes in treating anxiety and behavioral disorders with particular expertise in the treatment of anxiety-based school refusal. Welcome Dr. Dalton! Dr. Dalton: 00:01:53 Thank you so much. Dr. Dalton: 00:01:54 So I wonder…firstly we should probably get clear on some terms that we’re going to use today because when I started reading your work, there were a whole bunch of terms and I want to be sure that we use them clearly. Jen: 00:02:04 So you use absenteeism and truancy, school refusal, and so can you define these for us and then perhaps also help us understand how common these issues are. Dr. Dalton: 00:02:12 Sure. Yeah. So just thank you again for inviting me. This is something that I care a great deal about, and I treat many, many kids with these problems. Absenteeism is a global term. It’s an umbrella term that just defines kids who are not in school for any reason. It could be transportation, it could be illness, it could be anything. Truancy is more in line with delinquency; t’s against the law. These are kids who might leave in the morning and then never show up to school because they’re having too much fun in the parking lot or in the woods behind school. Oftentimes that’s more of a criminal justice issue, where school refusal or school avoidance is a more of a psychological development where kids often because of anxiety do not believe they are able to attend school, and so they literally refused to go. It could be kids won’t get out of bed in the morning. I do a lot of home visits for these kids and I’ve seen kids barricaded in bathrooms with their mastiffs guarding them and sending me off with hairspray when I get there and different things so it can be quite significant for some kids. Jen: 00:03:13 Okay. So in general we’re talking about slightly older children here, right? Because most of the parents who are listening to this are parents who are just sort of in this kindergarten phase, maybe some of them on the high end are in the transition phase. Some of them were toddlers transitioning into preschool for the first time, and this is probably not such a relevant thing for them. Is that right? Dr. Dalton: 00:03:33 It really depends, because the research says that there’s kind of a two different ages where we most often see the onset and one of them is five and six years of age, so it’s when kids have to first separate from their family and go into a novel circumstance. It is a time when we really see that now it’s obviously easier to get a five year old in school than it is a 15 year old just physically and logistically it’s a different ballgame, but we do see a lot of that along with a lot of parent tiers on the first day of kindergarten. It’s not just the kids who have separation, anxiety. Jen: 00:04:03 No, no, it’s definitely not, and when we’re talking about that preschool transition, at least I found it was… It was difficult for sure, but there were three teachers for 18 kids, so if you need someone to hold your child and give your child a hug and hold your child up to the window so that you can be high fived as you’re walking out the door, then that’s something that can be accomplished in that environment, right. Whereas in a kindergarten you’re kind of moving on from that. Dr. Dalton: 00:04:29 Yeah, I mean we’re looking for kind of the BAND-AID approach. A lot of schools use that so that the parents don’t even walk their kids into the building for kindergarten and then it just eases with the transitions are everyone’s saying goodbye at the door. All the moms are wearing dark sunglasses so no-one can see their tears and then the kids just kind of pivot into what’s happening next. That the separation, physical separation is a hard thing for everybody involved because it’s so novel for the family very often. Jen: 00:04:56 Yeah. Okay. Alright. So you’ve written that school refusal is a behavior rather than a diagnosis. So I wonder if you can help us understand the difference there from a clinical perspective and also does it make a difference for parents from their perspective and if it’s not a formal diagnosis, does this school refusal typically coworker with other disorders that are diagnosable? Dr. Dalton: 00:05:54 Yeah, you know, if there’s a thunderstorm, a lot of kids are afraid of being apart from the caregiver if there’s a thunderstorm. Dr. Dalton: 00:06:01 So we, we see a lot of that. We see kids who might have panic disorder so they feel like they’ve been struck by lightning from the inside rather than the outside. I don’t know why that happens. And so they try and seek proximity to a caregiver or just to their home environment. It could be social anxiety. We see a lot of younger kids with a phenomenon called selective mutism where they don’t talk in a school environment often for the first time. And so parents don’t know this because at home they’re a chatterbox and they get to their first teacher conference and say, yeah, um, you know, your kid doesn’t ever talk and they say, what are you talking about? They never shut up. And in school environment they literally don’t talk. And so that can morph into social anxiety and some cases school avoidance there as well. Jen: 00:06:45 So we just wanted to go back to something you said at the beginning of that. You mentioned separation anxiety disorder. My child doesn’t love being separated from me, but I guess what would be helpful to understand would be where do you draw the line between separation anxiety and separation anxiety disorder? Dr. Dalton: 00:07:53 Separation anxiety disorder is chronic and impairing. It gets in the way of their ability to fully do the things that otherwise they want to do so they don’t do sleepovers, that cannot babysitter sometimes. Sometimes they don’t go to school, clearly. It can really interfere and even within separation anxiety disorder, it can look very different so some kids have a fear of being alone and so they won’t sleep in their own bed, which drives parents crazy as you can imagine, or they don’t want to be in a different floor than where their parents are and they’ll kind of follow them like shadows throughout the house. Other kids have more of a fear of abandonment where they’re afraid of what if mom gets sick or dad and they can’t come and pick me up and they begin to worry a lot about what may happen down the road. They might fear the horrible things that the grownups fear like, you know, being abducted or school shootings or the horrible things like that. So it really does vary even within that diagnostic category greatly in terms of the way it presents itself. Jen: 00:08:52 Okay. All right. Thanks for helping us understand that little bit better. So you mentioned a lot of different reasons why a child might refuse school and in the reading that I did to prepare for this episode, I think they fit into four main criteria or sort of categories. Is that right? Dr. Dalton: 00:09:09 Yeah, that’s what the research shows. Jen: 00:09:09 Okay. And would you mind just reviewing those so that we can help to understand what those are and decide whether a child might meet one of those? Dr. Dalton: 00:09:16 Sure. So what you’re referring to aren’t diagnoses, they are functions. So behavior is many things. The one thing it’s never is random. It’s very complicated and confusing, kind of like meteorology with lots of different interacting variables, but it is fundamentally lawful and so when we do our assessment, we don’t just look at what is the diagnosis that someone might have in the DSM V or the ICD 10. We’re looking for what are the dimensions of their suffering, like how is it they experience the world, but also what are the functions of the behavior and there are basically four usual suspects that we can look for and they fall under two broad categories. The first one is positive reinforcement, which most parents have come across during their training somewhere along the way and it just means that if this event were to follow a behavior, that behavior is more likely to occur in the future. Dr. Dalton: 00:10:09 There’s two of these that really play into this specifically for school refusal. One is the pursuit of attention so often the parent’s attention, and the other one is tangible rewards. So a lot of kids learn very quickly and that they care the most about getting their parents attention. And what that translates into is a really important thing for parents to understand is that if you think of your attention as your son or your daughter’s paycheck, you’d be thinking correctly first of all, but it means you want to be very, very careful what you pay them for. Because if they exhibit anxiety based behaviors or even more broadly distressed behaviors and you being a compassionate, caring parent, try and come in and reassure them and tell them it’s going to be okay and to hug and and do all the things that loving parents do well, you’re really attending to the anxious behavior and thereby increasing the frequency of that over time. So we want to really understand the attention-maintaining behavior is a really important function of school refusal because secondary to tragically hurting yourself or not eating, not going to school was one of the best ways kids can think of to get and keep a lot of attention. The tangible rewards are often not the primary reason why kids are not in school, but they pick up pretty quickly that if they’re home or having all these problems, they get access to things they wouldn’t get access to. I remember when I was a little kid and I have a younger sister and one day I had strep throat and I stayed home for a couple days. My mom and I hung out and played Chinese checkers and ate grilled cheese sandwiches and it was super fun and on the third day my throat was getting a lot better and my mom said, all right, time for school, and I said my throat really hurts and that wasn’t why I was staying home, but it certainly makes it… it’s in competition with school attendance is when kids are are staying home and they’re doing really fun activities. They’re watching cartoons, they’re playing on Xbox, they are on their, you know, whatever Apple device or a Samsung device they happen to have in the house and that becomes part of it as well. So that first category is positive reinforcement, again, with either parent attention or tangible rewards. Dr. Dalton: 00:12:13 The other one is called negative reinforcement. And even Grad students gut to this wrong, negative reinforcement is not punishment. Whenever you hear the word reinforcement, that means that you’re going to be increasing a behavior. So negative reinforcement simply means someone gets to not feel the stress after doing a behavior. So for me, that means pressing the snooze button in the morning, that it feels awful to be ripped out of the night’s sleep in a corner and a nice warm bed and pressing the snooze button makes it awful noise go away. So that’s negative reinforcement. Turning off the smoke alarm when I’ve burned my food, again, that’s negative reinforcement. And so when kids show these problematic behaviors and parents say, okay, well we think that you’re pretty fragile and it’s really hard to see you in this distress position, so we’re going to give you a mental health day, we’re going to let you stay home today and not deal with this situation that is immensely reinforcing for these kids. So other two categories, functions would be either the escape from situations that you were already in. These are the kids who are calling home sick from school because our stomachs hurt at 9:30 in the morning or the avoidance of it entirely. So escape or avoidance or the other two functions that we most commonly see. That’s a very long answer, but those are, those are the four usual suspects that we deal with. Jen: 00:13:30 Okay. Alright, that’s helpful and so all of this is sort of riding on the idea that the child can or will tell you why they don’t want to go to school. My daughter’s in preschool and sometimes she will just say, I don’t want to go to school, and you have. If you asked her why she doesn’t want to go to school, she just doesn’t say anything. She just doesn’t answer or can’t answer. Or there’s something going on. So what do you suggest for parents of children who are possibly on the younger end or perhaps on the older side and just don’t want to tell the parents? Dr. Dalton: 00:13:59 It’s a really great question. When I read my book someday it’s going to be called “I don’t know why, I just can’t go,” because that’s the most common answer that we get from kids. Even the teens don’t really often have an idea and they can guess wrong. You know, kids will say answers and deny other aspects to it. So we do what’s called a behavioral avoidance task or a “show me you can” So kids say, “oh yeah, I don’t have any problem with being embarrassed or anything like that.” Great. Let’s put on these embarrassing wigs and walk out in public and they’ll look at me like I have 10 heads and say there’s no way I’m putting that onmy head. And so they’re often the last ones to know. Jen: 00:15:13 Okay, all right, so try and get to the root cause of what, what it really is, which I imagined can be hard for a parent who hears “stomach ache” and thinks maybe she ate something she shouldn’t have. Dr. Dalton: 00:15:24 Yeah…avoidance is the purest measure of anxiety at our center. We always say that we don’t treat anxiety because we don’t have to. Anxiety is temporary and harmless. What we treat is avoid it’s avoidance can ruin lives. And so what we recommend for parents or professionals is to look at the pattern of avoidance. We call it the constellation of feared or avoided situations. And we try and look at those as being the equivalent of branches on a tree. And we want to get to know the trunk that ties them all together. So if you had them rate from one to 10, how scary it is to do a variety of different things. Well again, it’s not random or the nines are nines and the twos are twos. A lot of our kids, they fear the classroom because they’re afraid of maybe getting something wrong or being called on and they have to talk in front of the class. Dr. Dalton: 00:16:12 Other kids, they’re more afraid of recess and lunch because it’s unstructured situations. They don’t know what to say or do without a rubric to follow of the classroom, and so we want to really understand within each kid what is the constellation of their avoidance, where do we see them avoid as a method of coping with it, and then from there we put on our detective hat and try and understand, okay, if they’re avoiding these pattern of things, what is in the middle of that, but these avoidant behaviors are orbiting around and that gives us a pretty clear line of sight for most kids to better understand it. Jen: 00:16:48 Yeah, and you’ve said a couple of times now behavior is never random and I love that and I would add to that and it’s never designed to make the parent annoyed or frustrated. There’s pretty much always…I mean, I guess occasionally children will push your buttons for the sake of pushing your buttons, but for the vast majority of the time they’re showing this behavior because there is some underlying reason for it and if all you do is address the top level, “you will go to school,” then you’re never really understanding or addressing what the undercurrent is this really causing this behavior. Is that right? Yeah. Jen: 00:17:27 And why are you doing this to me?! Dr. Dalton: 00:17:27 …we say we’re saying you’re asking the right question, but in the wrong way, we want to ask what to curiosity because it’s fundamentally an answerable question about why this is happening and it’s hard when it’s your own kids. I mean I have three of my own kids and it’s the most humbling thing for a child psychologist, but I think that, you know, having that curious observer standpoint, kind of putting your scientist lab coat on and trying to look at the situation and try and figure it out rather than to personalize it, I think is an important step in the right direction. Jen: 00:17:59 Yeah. Okay. So one last background question, I’m thinking about risk factors for school refusal behavior. Are there specific risk factors and do these shifts as children get older? Dr. Dalton: 00:18:10 Yeah, so there are certainly risk factors. There are some that are very short term. So if we have a kid who’s missed a lot of school because of an illness or injury, it’s hard for a lot of kids to get back into school. So they didn’t stop going because of anxiety, but anxiety prevents them from returning to school. So we took, I talked to a lot of schools and we always talk about the kids who were at risk for this and just prolonged absences for any reasons are certainly a part of that. Transitions between schools, so going into kindergarten, going into middle school, going into high school are broadly risk factors for, for most kids, if there’s a geographic change, the other risk factors if there has been bullying at school, those are risk factors that we see. Dr. Dalton: 00:18:50 But even before we, you know, think of the more immediate, we’d call them proximal risk factors, there are certainly things that are making kids more vulnerable. So we know through a lot of research that even really young kids, some talking before toddlerhood, we can look at patterns of avoidance. We can look at what’s called behavioral inhibition or BI and there’s a high correlation with kids who during infancy show behavioral inhibition and develop social anxiety later in life. We see with school refusal, there’s a lot of anxiety throughout the family system, oftentimes in the direct parents, but oftentimes outside of them as well, where there is just, you know, a lot of vulnerability for anxiety. Um, which isn’t a negative thing when the parents deal with anxiety themselves, we know that the best positions them to be the model to serve for their kids. You know, we always are half joking when we say that we’ve discovered that if you have a kid who’s smart, creative, and compassionate, the universe seems to throw anxiety in for free, that’s the parents as well, that the more compassionate and caring the parents are, the more vulnerable they are to being so invested in their kid’s welfare that it becomes anxiety producing for them as well. So that certainly is a risk factor. It’s not a blaming issue, it simply means that those parents are really well positioned to cope out loud and to serve as a model for their kids. Dr. Dalton: 00:20:17 Yeah, so behavioral inhibition. It’s a, you know, a characteristic that we see in kids from very early on. I’m a scientist named Grey had done this many, many years ago and looking at kids how much they retreat from novel stimuli and whether or not they habituate to things. And so kids who who use more retreat based behaviors in the presence of novel stimuli tend…they’re showing a vulnerability in the nervous system. They’re showing an indication that they react and more of an intense way in their nervous system. And you know, evolution has taught all of us to avoid things that make us sick, hurt, or scared. You know, anxiety is there for really good reason that keeps us safe. But like any system, it can malfunction like an emotion light that goes off when the wind blows. And that’s what makes an anxiety disorder possible. And so kids who display these tendencies of retreat-based behaviors are just more vulnerable for is it doesn’t mean they’re going to develop those things. Dr. Dalton: 00:21:10 It just means that parents want to be on the lookout for avoidant tendencies and to work really hard to not let the kids have as a means of coping because it does work in the short term to reduce their kid’s distress and thereby reduce the parents’ distress and nothing hurts more than seeing your own kids uncomfortable. But it just means we have to be really careful that we lean into the distress and don’t teach the kids did this is the wrong way to feel and that we shouldn’t feel anxiety. To me, that’s like saying you shouldn’t get sweaty when you work out, which just means you’re getting a good workout when you get sweaty. And the same thing is true when it comes to anxiety. Jen: 00:21:45 Hmm. Okay. So as we start to think about how this is treated, when I’m reading papers about it, a lot of them seem to consider it as the child’s issue and child’s problem. Unless we treat the child, but I did an interview recently with Dr. Arietta Slade, who is an attachment theorist and that will be live by the time your interview goes out and so I was absolutely fascinated to find a paper on the importance of attachment and the attachment relationship in the classroom and this really goes beyond just a teacher and a student liking each other and I’ll quote from the paper. I found this in: “to a deep and enduring affectionate bond that connects one person to another across time and space,” and this attachment helps the child to feel soothed by the adult and also enables the adult to respond sensitively to the child’s signals and that relationship has been linked to better academic outcomes. Jen: 00:22:34 And so connecting that to another study on actually 40,000 students in Chicago – that was a pretty big one that showed that children who liked school have better academic outcomes than children who don’t have children who think their teachers care about them and respect them are more apt to like school and those who don’t, which reminded me of an episode we did a long time ago showing that the only thing that predicts whether children will eat their vegetables is how much they liked vegetables, but I was surprised to see the teachers expectations for students’ achievement actually in that study at least had a negligible effect on whether the students liked school. So I’m wondering if you find this lack of attachment relationship between the teacher and the student to be an important factor in school refusal and kind of on the flip side of that, from the teacher’s perspective, is it realistic to ask teachers to develop this attachment relationship with a child who’s going to be with them for maybe a year or two and then move on and then you have to do in 30 more kids? Dr. Dalton: 00:23:30 It’s a great question. I don’t know what the research would indicate. I don’t think there is research about attachment issues specifically, but anecdotally, from my experience, I’ve dealt with hundreds of educators. You know, we do a lot of school visits and we do a lot of teacher at school, I think it’s a protective factor. I think that when kids feel safe, they’re are more likely to find alternative ways to cope. A lot of the kids really, you know, the foundation of, of anxiety is uncertainty and lack of control and so if they’re in an environment where they feel like the teacher isn’t invested in their wellbeing or isn’t responsive to their needs, that would, I’m sure, increase the likelihood of avoidant coping as a means of responding to it. In terms of what teachers can do, I think it really varies a lot. I know your audience is largely for kindergarteners and when you have 23, five year olds in a room, you know that’s pretty tough. Dr. Dalton: 00:24:22 But everyone remembers their kindergarten teacher, because I think that the bonds are so important during, during that time. Whereas a ninth grader where there are seven different teachers in two specialists, you know, during the week and 33 kids in each class, that becomes much more challenging to establish that kind of a bond. But I do think it’s really important and I think that broadly most kindergarten teachers get into the field because they like relationships with kids and they like to be that person who a trusted adult. There is a lot of research that shows that having a trusted adult outside of the family system does serve as a protective factor to build resiliency, broadly speaking. And I think that having a teacher play that role would likely also serve that same capacity. And that being said, one of the things that we do a lot of is we do train educators because how to help someone with anxiety can be really counterintuitive. Dr. Dalton: 00:25:14 So if you have someone who is, has an anxiety disorder and it’s interfering with their education when they’re in school and they’re looking for reassurance, well the paradox is that a good educator, like a good caregiver, if they attend to the wrong behaviors, that they offer reassurance to someone who was looking for it. That actually serves to validate the need to ask for reassurance and strengthens the anxiety over time. So a big part of this is how to train parents and educators about how to selectively use their attention to catch kids, so to speak, coping effectively, and to give them that, that fist bump or high five or the pat on their back or the note at the end of the day saying, I really like how how you were brave today. So it really is in addition to the attachment, it’s how do the educators really respond when the kids are showing the anxiety for perhaps most importantly is how do they do it when they’re not, how do they really reinforce and phrase and to give the kids what they’re so thirsty for in response to kids coping effectively with their world. Jen: 00:26:17 Yeah. And so that it sort of helps me to go towards what I think is the logical conclusion on this issue, which is when you think about levels of student conflict between students in kindergarten teachers, they’ve actually been shown to be higher for children who are male, black, have experienced greater mean hours in childcare and they have lower academic scores and more acting out behavior in class. And so what I’m thinking about is it’s sort of the potential start of a really undesirable cycle where the children from certain backgrounds might enter school with some characteristics that make it more difficult for the attachment relationship with the teacher to develop and potentially, you know, not only are they not getting positive reinforcement and the desirable times, but they’re also – maybe the teacher just kind of turns away and just doesn’t give the reinforcement that the child needs, which can really impact the child’s willingness to attend school and follow on outcomes related to their academic performance. What do you think about that? Dr. Dalton: 00:27:16 You know, I, I think that we should… Those vicious circles happen a lot of times where it becomes what’s called transactional. So kind of the arrows go in all directions as a way to describe it. So if a kid has been growing up in an emotionally or financially impoverished background and they haven’t had the Head Start or the, you know, the preschool experiences and they’re in an environment they’re not equipped to be able to handle, they’re going to show behaviors that are troubling and bothersome. And then they’re going to draw attention for the negative behaviors and the more they get attention for negative behaviors, the more they tend to exhibit them and does give them that feedback loop where kids learn to associate school with a place that’s not fun, a place where you get in trouble place where it’s hard to do things other kids can do, and then you get into this place where the they don’t want to be there, the worse their worst behavior becomes. Dr. Dalton: 00:28:02 And then teachers are human and they’re not going to particularly enjoy all these corruptive negative experiences with a kid who’s troubled in the classroom. But just as there’s there’s a vicious cycle, there’s a virtuous cycle. And the same thing can happen in an upward spiral effect to that. If we can work to, you know, even if we’re looking to, to reinforce and the island of good and an ocean of bad behavior, we know that that will increase the frequency, intensity and duration of those positive behaviors. And so really it’s about going against our instincts to put fires out rather than to notice the good stuff. But, but this is a hard thing to do when you have 25 kids in the classroom, many of whom are going to have developmental challenges or economic challenges and a lot of teachers I talked to, they, they feel like they are in the crowd control mode some of the time and it’s, it’s really hard to be educators and social workers and counselors all in one, which a lot of kindergarten teachers nowadays really are required to do. Jen: 00:29:00 Yeah. Yeah. It’s not an easy job by any stretch of the imagination. So I wanted to talk a little bit more about the consequences of school refusal and I think in kindergarten and particularly in the lower grades, it’s tempting to think of it in the short term while our children are young, so you know, they miss a day of reading instruction or they miss the day that it was discussed which order the planets are as they come out from the sun. And it sort of…”So what?” But what consequences does school refusal have in, in the broader scheme of things. Dr. Dalton: 00:29:31 This is why I care so much about this topic, because the consequences are are profound and severe and it’s not because they didn’t learn how to conjugate a verb. It’s because they’re mastering avoidant coping, avoidance of experience on boarding of emotion is the foundation upon which most mental disorders are based and so when kids learn that, okay, I’m not equipped to be able to handle this situation, so therefore I’m going to avoid dealing with it and it works. It pays off in the short term; it becomes their go-to response; they become masters of avoidance, and that’s the the pattern they begin to develop. Even in kindergarten, that becomes their template. Okay, I’m not efficacious enough as a person in order to trust myself in this situation, so I’m going to avoid doing that thing or being in that situation. So avoidance is kind of the antithesis of efficacy, self-efficacy, which is a foundation that we really want kids to develop, is that they want to believe in their own ability to cope effectively with their environment and you can develop that when you’re using avoidance as a means of coping with it. Dr. Dalton: 00:30:37 And so there’s not a whole lot of longitudinal research out there, but there is some looking at the consequences of this, and and some of the studies have found that for instance, 45 percent of the kids, he refused schools for prolonged periods of time, never graduate from high school. And we look at the even further than that, we look at lower rates of employment, you know, we don’t call it “work refusal.” We call it unemployment when they’re older. We know that relationships don’t tend to do very well if kids are avoiding or adults or avoiding any issues that are affecting that relationship. And so helping to nip this in the bud, we can really change the trajectory these kids are on by helping them to learn appropriate non avoidant means of coping with their own emotions. And it’s a really important thing because it’ll teach kids things about themselves they couldn’t have learned any other way than by confronting those situations that they were at first reluctant at best to be in. Jen: 00:31:34 Yeah. And for those of us who weren’t lucky enough to address it in primary school, it’s something we spend the rest of our lives learning how to do. So when we think about helping parents to understand what’s the difference between normal resistance to a change that the child can overcome by toughing it out for a few weeks and a real problem that needs to be addressed with professional help. And I think back again to the interview with Dr. Slade where she told us that a good standard to use is not by how much the child protests you’re leaving, but the teacher’s report of the rest of their day. And if the teacher says the child was fine five minutes after you left them, it’s probably not too much to be concerned about. But if there’s distress and anxiety throughout the day, then there’s probably a bigger problem. And we’ve touched on that briefly here and I am guessing that you’re going to be roughly in line with her, but I’m also curious about what is the child is anxious throughout the day, but potentially this could only be a couple of week thing. How long do we wait before we consider this an issue that is really that we know we should be getting professional help for? Dr. Dalton: 00:32:36 Well, so let me begin by saying this, the median of onset for anxiety disorders is only 11 years of age, so half of all kids who during their lifetime is going to have an anxiety disorder, half will have one before their 11th birthday. Right now we know that before the age of 18, 38 percent of girls and 26 percent of the guys are going to have at least one anxiety disorder. We know that the kids now are more stressed than their same-aged peers were during world war two or during the Great Depression, so we’re really living in the age of anxiety where this is becoming more and more problematic. So that by itself makes me side of that. If you’re really concerned having an assessment done by an expert so that we can better understand it. I fully concur with the other expert talking about…that a lot of kids will cry for two or three minutes. Dr. Dalton: 00:33:23 A lot of the kids that we see here and half of our cases here or school refusal cases by the way, they’ll cry for seven hours, you know, in the counseling office and never come out and so we’re looking at a level of suffering and level of impairment. And so if someone is really finding that they can’t access the curriculum, it’s interfering with their ability to learn, you know, imagine that you’re next in line to go bungee jumping and someone’s trying to teach your calculus. There’s no way that you can possibly retain that information. And so just like you can tell by the sound of the alarm if you burn your toast or the curtains are on fire. The same is true with our fear alarm. And so even though we know they’re not in any danger, it doesn’t mean they’re any less fearful than we would be if we going to go sky diving. Dr. Dalton: 00:34:06 And so that makes their ability to process, retain new information, just virtually inaccessible for them during those periods of time. And so if we’re seeing a lot of distress on Sunday evening, Sunday evenings about anxiety, Monday mornings about fear, if you’re seeing kids who don’t want to sleep in their own bed or they’re having a lot of somatic complaints increasing with the school year beginning that’s not going away. Increased irritability after school, you know, I call it the Shaken Soda Cans Syndrome where kids have been working to contain themselves all day and then when they come home and they just explode and you can’t tell by looking at the can, which was shaken, which one was until you open it. That’s the way a lot of these kids are. So it takes so much effort. I mean it does for all kindergarteners anyway, but if you’re seeing that it’s not going down after a couple of weeks of the new year, those are definitely warning signs that you want to be careful about. Jen: 00:34:58 Okay. Alright. And so when a child comes to see you for the first time, what happens? I understand that there are assessments that you can do. But when I started looking into the methodology for how some of these things were developed, they sample sizes are really tiny and in one of them, two thirds of the sample was youth who were housed in a juvenile detention facility, which is obviously of interest to clinicians, but it made me wonder if the assessments using these kinds of methodologies and in their development or applicable to the kinds of children whose parents are probably listening to this show. Dr. Dalton: 00:35:29 Sure, yeah. Well the first thing we do, and this is my bias, but when a kid walks into the room, we almost begin with the same thing every time, which is that we have plenty of time to get into what brought you here, but I want to get to know you as a person. So what do you love to do? I’ll ask the parents in front of the kid what makes you proud to be his or her parents? So we look at the whole child and we look at the idea that every virtue you casts a shadow and the anxiety is often the shadow of these great virtues. And it’s really important that we get to understand the child and what’s right about them and not simply a litany of what’s going wrong in their lives. In terms of the assessment, I mean, we certainly rely a lot on our clinical interview. Dr. Dalton: 00:36:09 There are semi structured interviews. There’s one called the ADIS, which is the Anxiety Disorder Interview Schedule that really has a lot of good validity behind it in terms of identifying appropriately which anxiety disorders are present, if there are any. The School Refusal Assessment Scale, Chris Kearney out at UNLV does the best research in the world on school refusal, so his revised edition now. That gives us a snapshot of those four usual suspects that was talking about before. It’s a very effective inappropriate technique. We use one called the School Situation Efficacy Scale. I believe it’s called looking at how effective the kids think they can be in a variety of social and economic situations that he she would confront during school. We do the MASC, which is the Manifest Anxiety Schedule for Children or the scared [unsure of this acronym]. We use the Child Behavior Checklist. Sometimes we’ll certainly use the Child Depression Inventory if we think there is a risk of depression as being a part of the picture and we go out and we talked to the parents and we talked to the schools and we sometimes do observations in the schools as I mentioned before, doing the behavioral avoidance task with the BAT is also really important because kids don’t know often what they’re afraid of and so watching them do a variety of things that some kids have a hard time with like reading out loud or writing on a board in front of us doing a brief presentation. Dr. Dalton: 00:37:31 All of those kinds of things give us a window into it as well. That’s just a fascinating thing. Kids often don’t know what they’re afraid of. Dr. Dalton: 00:37:38 Yeah, no, that, that’s actually really typical. Even with the really smart kids that we often see here that were even older and they can define all the SAT words and they don’t know themselves very well. Jen: 00:37:49 Interesting. That sounds like it might be a topic for another day. Dr. Dalton: 00:37:56 Okay. So you put them through a battery of tests. You talked to the parents. You talked to the teachers, you talk to the child and then you get to some kind of treatment. What are some of the treatments that are available for school refusal and how are these effective? Dr. Dalton: 00:38:08 Yeah, so thankfully they are effective. So begin with the good news first is that thankfully there exists some really well established evidence-based treatments for anxiety disorders broadly and then school refusal, which is often a symptom of an anxiety disorder. So we began, as I mentioned, with a really careful assessment because it really does serve as the foundation on treatment. So we would help someone who has panic disorder in a different way than we would with someone who has separation anxiety disorder. And so we want to get that part of it right. So what we do is we begin with psychoeducation, is that we want to give the kids kind of the owner’s manual for their nervous system in an age appropriate way and also for the parents. Dr. Dalton: 00:38:48 So we go through a lot of information about what anxiety is, what it’s not; about how to develop a different relationship with it; how to think differently about their own anxiety. We know that we tell the kids that our thoughts are the window through which our feelings see the world and so we want them to be able to see things more accurately. The one common thread across every single anxiety disorder is a complicated term, but actually a really easy concept. It’s called overvalued ideation. And what that means is people think that thoughts are more important than they are. We want to help kids and adults to not believe everything that they think to realize that in this moment I’m having a scary thought and that’s an accurate statement, but my thoughts are not evidence. Just like feelings are not facts. So we want to educate them about how the anxiety alarm can go off and, and why the sensations you feel are occurring. Dr. Dalton: 00:39:39 So why did your palms of your hands get cold and clammy? Well, there’s an answer to that and here’s what it is and we’ll explain it to them and we’ll talk about why their heart races or why they might have a hard time focusing and concentrating. So they can really be an informed observer of their own anxious experience when they have it. We talk a lot about the role of avoidance. Avoidance and fear are teammates. We talk a lot about how do we help them to choose a different path other than avoidance. How do we know that, you know, occurred [?] is what you do. It’s not what you feel. So a lot of psychoeducation base for the kids and the parents. In fact, we have a parent training group. We actually have to usually at the same time for parents of kids who were refusing to go to school. Dr. Dalton: 00:40:20 That’s how commonly we see that, that we can field two groups and we go through…again, it’s very didactic. It’s very evidenced based. It’s not a support group, it’s a roll up your sleeves group. It’s about understanding how to use differential reinforcement, how to not by accident offer reassurance to somebody and thereby increase their motivation to seek it out again next time. So the parent training we found to be absolutely essential. And then few years ago we kind of stumbled across something. It was just me back then, there are eight of us now and I was seeing all these kids with school refusal and one of the benefits of that from a logistical standpoint is you can see them during the daytime because they’re not in school. And then when you get them into school, that’s just the beginning of their treatment needs. The fire has been put out but their needs haven’t gone away. Dr. Dalton: 00:41:05 And so I thought, well, how in the world can I get these kids in? I’m not gonna take come out of school. We fought so hard to get them into schools. I’m not going to come out to them, see them. So how can I meet these kids’ needs now between the hours of let’s say three and 6:00. And so I began a group and the, and the joke at first was, well, good luck. No one’s going to show up because it’s a school refusal group. And that was kind of true. But once the kids got in the room together and they understood each other and they knew they could be understood intuitively by people in the room and that the kids were saying things like, this isn’t, you know, rather than saying this is what you should do, they would say things like, well, here’s what works for me and here’s how I got back into school. Dr. Dalton: 00:41:43 So it became coping models for the kids. They became full of reassurance for each other. And when I asked the kids who graduate from our care, what did we do that most helped you? Almost to a one. They say the groups because these kids are so isolated when they’re not in school, that this becomes the place where they feel they can connect and that is centered on goals that are achievable and measurable and they come back in oftentimes like can’t wait to tell the people what they’ve done that week and their reentry plan. So the groups are really important and the parents find that by the way, in the parent group, but it’s very didactically focused. And what we found is that the parents just, they benefit so much from being with other really good parents who would dealing with the same issue and are just as lost as they are in the process. Dr. Dalton: 00:42:29 And then the fourth part that we do is school consultation, so we have a meeting in the school building as often as we can. We caught a roadmap for success meeting where we looked at the obstacles for reentry and we train the educational team on the child’s mental health condition and what they can do and what they should avoid doing to help with the integration plan as a quick little snapshot. The biggest obstacle to reentry is uncertainty. So kids are not sure whether their friends know where they’ve been or has there been a seating change, something as simple as that can throw kids off or how do they make up the missed work they haven’t been there for. And so how big the whole team to work in concert together to establish a plan for reentry is really important. So those are, we call the comprehensive model. Dr. Dalton: 00:43:17 That’s the four parts to it as following the assessment is individual exposure based treatment. Exposure based is really important. It’s has the strongest evidentiary base of any treatment for anxiety disorders along with psychoeducation. That’s, you know, those two go together helping the kids have a different way of thinking about their own anxiety to be able to talk to themselves like their own best friend rather than their own worst enemy. Parent training, the kids group and then the school consultation and we often find we need all four pieces of those to really get the kids back in and and just for the listeners benefit, we want to begin this early if the kids are not going to school because every week here we see kids who haven’t been to school for three years and this can be something very pernicious that can dramatically affect the trajectory of these kids’ lives if it’s less to kind of have left metastasize into, to grow into something worse over time. Jen: 00:44:13 Okay. And so I wanted to talk specifically about a couple of treatment methods that I have read about and specifically I wanted to clarify some terminology. You mentioned exposure based treatment. Is that the same as cognitive behavioral therapy? Dr. Dalton: 00:44:27 Exposure therapy is under that umbrella term of CBT. Dr. Dalton: 00:44:30 And so one of the things for listeners to be aware of is that CBT is, is a kind of a collection of techniques and approaches that are evidenced based and rigorously researched that are shown to be effective, but a lot of people out there unfortunately will say I do CBT along with these other things and when they come into our care we’re often the third or fourth person to see somebody and we realized they really haven’t gotten CBT before and so the kids don’t know that they weren’t given a treatment that didn’t work. They think that they don’t work. And so I asked her parents to do is what they’re looking for a clinician interviewing them over the phone is don’t ask, “Do you do CBT;” ask “Do you do exposure therapy?” Because then you’re going to find someone who’s really well trained in treating anxiety disorders through an evidence-based modality if they’re fluent in what exposure therapy means and they use it on on a regular basis. Jen: 00:45:22 Okay, and so when I was reading the literature on this, it typically focuses on school attendance as being the primary goal and once the child is attending school, probably around 90 to 95 percent of the time, Most of them use the standard, then they consider the problem was essentially solved, but these studies don’t look at other factors like whether the teacher and the child have an attachment style relationship or whether the child reports liking school or whether the child goes on to achieve positive academic outcomes. It seems to me to be a very short term-focused “is the child in school or not,” but I’m wondering what if the child ends up sitting in the back of the class resenting every moment that they have to be in school and not learning anything? Dr. Dalton: 00:46:04 Yeah. Yeah. We want to avoid that. The research indicates that rapid reentry back into school is the first and foremost thing to accomplish because it gets much worse. It’s like you’re skiing and you’re falling. It’s not going to get any better than farther and faster you go down and so we want the kids to get back in as soon as we can in some candidates come in and they understandably, their goal is, well, how do we get rid of the anxiety so that he or she can go back to school and I’ll always joke and say, well, that’s like saying “I’d love to go to the gym, but I want to get in shape first.” Going back into school is part of a treatment for the anxiety disorder. It’s about having new interactions with their own anxiety, gaining self-efficacy and self confidence I was talking about and their own ability to cope, to be able to establish peer relationships; we know that’s a vitamin C against depression; being back in the rhythm of being an everyday student and having that routine is really important. We know the longer kids are out, the more at risk for depression and and worsening anxiety they are and so we want to get kids back into school, but that’s the first step. We celebrate it when the kids get back in because it’s like, okay, now we can get to the real work here because at that point they really need the skills, you know, we think of what are the skills that kids don’t have and they really need to work on, and so there is a high rate of relapse. If have kids have a tendency to not be in school, then the next that goes bump in the night for them….f they’ve been out for their, you know, for a sore throat or they sprained their ankle, that’s at high risk factor for them. Dr. Dalton: 00:47:37 If they have a learning difference and they’re not being well accommodated, that’s a huge risk factor for them. If they are for any reason being bullied, you know that it’s easy to fall back on that slippery slope and so we want to arm the kids with a lot of of well-rehearsed skills and techniques they can be using to be their own coach. While they are facing these concerns now, we can’t necessarily make them fall in love with being a student, but that’s true of all the kids; they oftentimes only in retrospect see the value in education. A lot of kids that we work with, it doesn’t feel very germane to them in that moment that they’re taking that class or learn that bit of information and so we want to give the kids the chance to cultivate that passion, to be able to discover their own passions and develop their own passions rather than simply discovering them and at the same time knowing that they need to kind of stay on offense against the anxiety. Dr. Dalton: 00:48:32 And what we find though is that once kids can do these kinds of things, they really do develop a new sense of self. They learned that there are stronger and braver than they have suspected that they were and they began to be able to answer the question, “I know I can do this because of blank.” Well now they have lots of words or experienced to put in that sentence and they’ve been able to see that they can overcome obstacles and I truly think that kids are better off for having had an anxiety disorder or going through treatment coming out in the other side of it, having no longer have that diagnosis. Then they would be if they haven’t gone through the whole treatment and the whole anxiety disorder because they’re learning that they can overrule fear as a decision making tool. They’re making choices based on preference and values and not comfort. Dr. Dalton: 00:49:19 You know, you were beginning talking about the novelty of going into kindergarten and how change is hard for kids and the parents and that’s certainly true. But we also know that growth and comfort are often incompatible things and so when kids and parents are in situations that are, that are new and maybe even challenging and the kids might even struggle at times. That is also a source of value and virtue for the kids over long periods of time. So I think having that growth mindset, I know it’s a buzzword these days, but being able to see that this is something that they can develop into this is something that’s going to challenge them to discover their strengths is a really great way of thinking in a healthy way about these changes that are coming up in the next couple of weeks for the listeners. Jen: 00:50:07 Yeah. Struggle is not necessarily a bad thing. Yeah. So as we wrap up here, I wonder if we can just think about some, some of the things that parents can do right at the very beginning of this process to try and get through this without it full blossoming into a full-blown school refusal. So I read a on this topic that’s more geared towards professionals states: “common parenting mistakes in the morning include chaotic routines, failing to establish reliable transportation and poor supervision of the school preparation process, “which I thought was lovely but not terribly constructive. So there are. I think there are things that we can do, like minimizing the number of tasks that need to be done in the morning and trying to make those tasks easier by doing things like laying out the clothes the night before. But are there other things that maybe we might not have thought of yet that we could do either the evening before or the morning of that can help our children through this adjustment period? Dr. Dalton: 00:51:02 Yeah. I think, you know, so the very basic things like having a routine so the kids are doing the same thing everyday is really important. I think just establishing what we call the aura of inevitability, you know, that this is something that the kids are going to do and they’re, and they’re, you know, all kids have to go to school and this is part of the process. But I think as a pneumonic, you know, when I trained the parents, I talk a lot about watering the seeds, not the weeds. So the idea here is that, you know, imagine that you bought this beautiful house that does as overgrown flowerbed with very thick prickly weeds you can pull out. One of the things you could do is plant the small seeds and look to water and give nutrients and sunlight to the seats and deny those very same things to the weeds, and if we can do that over time the weeds will wither and the seeds will grow. Dr. Dalton: 00:51:43 So it’s about telling kids with specific positive praise. Like wow, I’m so impressed that you went in when you were afraid. That is so cool that you could do that. I’m so proud that you have such bravery yesterday to do that. So we’re looking to catch the kids coping effectively even in the presence of distress or if someone’s has frustration and they can’t do the homework because they can’t stay in the lines and they want to crumple up the paper and throw it away instead. It’s more about, well I really like how you were able to stick with it even when it was hard. And then when the kids do get this dysregulated, and they might cry or throw a tantrums are the things that kids do, sometimes that’s where we want to selectively not attend to that behavior. Dr. Dalton: 00:52:34 We want to redirect that behavior or to say things that are validating, like, like I can see that you’re feeling pretty upset right now. What can you do when you feel that way? So that we’re referencing their own ability to look inside themselves for ways to cope and the younger ones are going to have the answers. So we might give them some things they can tell themselves like, just because I’m scared doesn’t mean I can’t do it, so we’ll create coping cards for the kids here and have them kind of memorize the low over time. But really the parenting strategies are about looking to catch them coping effectively. And to reinforce that. There’s a powerful scene in the movie Ray about Ray Charles. I show a lot of my trainings where ray is about an eight year old boy and maybe a little bit younger, has lost his vision and he’s walking into the little home. Dr. Dalton: 00:53:20 And stumbles and falls and it cries out for his mom who was about 10 feet away, but he can’t see her, of course, and Mama’s tears in her eyes and wants so badly to go over and hug them and tell them it’s going to be okay, but she doesn’t and what does Ray do, well, the only thing Ray can do is he gets up and he brushes himself off and he finds a way to navigate the room because she knew that wasn’t going to do me any favors. And so she did the hardest thing of all, which is not hug them and tell them it’s to be okay, but she gave him the greatest gift, which is self discovery of new and better ways to cope. And then as soon as he used those skills effectively, she ran over and gave him a big hug and a squeeze, and tears in her eyes. Because it was such a powerful moment. And that’s what we want to recreate these families, is to help them to change the discussion off of fear and anxiety, onto resilience and courage. And to help the kids to find that path appropriately. Jen: 00:54:15 Wow. And on that note, we’re out of time. Thank you so much for taking the time to talk today. I’m so grateful to have the opportunity to understand this in much greater depth from the literature and learn and really give us some concrete tools to help parents as well. Dr. Dalton: 00:54:31 Great. Well my pleasure to be here. I really appreciate the invitation. Jen: 00:54:33 So Dr. Dalton’s Center for Anxiety and Behavioral Change can be found changeanxiety.com. And you’re in Rockville, Maryland. Do you do remote consultations as well? Dr. Dalton: 00:54:42 We do and we have families who actually fly in from other parts of the country are actually overseas sometimes to do intensive work here as well. Jen: 00:56:32 for example, your child has a really problematic relationship with their teacher or they’re being bullied and you live in a small community with only one school, so there’s no opportunity to transfer classes or schools. Then it’s possible that homeschooling could be a potential solution. Or perhaps you’re settling into the school year a bit and you’re starting to recognize some of the limitations of the school system. Like large class sizes and overworked teachers focus on using rote memorization to prepare for standardized tests and the fact that by third grade our curious toddlers who essentially would never stop asking questions no longer ask any questions except how do I do this thing you’ve asked me to do and will this be on the test so it’s possible that homeschooling might be something that could help you in this situation, but you’re probably thinking there’s no way that I could homeschool because… And perhaps you’re thinking because I don’t even know if it’s legal in my area or I don’t know everything my child needs to know before we start or can homeschooled children even get into college or how to homeschooled children, get socialized or how could we ever afford one parent to quit working? Jen: 00:58:18 although I think we’re going to do an episode in the future about how that isn’t always the way it turns out that they you see the school system isn’t everything you wish it was. Then I have another course on supporting your child’s learning in school that might be a better fit for you. Parental participation and children’s education has been shown time and time again in research studies to be a critical element of their academic success. But there are so many different ways to participate from helping with homework, to tutoring in the classroom, from fundraising to join the PTA, from guiding your child’s exploration of topics that really interest them to maintaining their intrinsic love of learning, to helping them prepare for standardized tests. This course helps you to understand the power dynamics at play in schools and your place in them as a parent and shows the range of potential ways you can participate in your child’s learning and how effective these might be in your specific circumstance. Jen: 00:59:11 There are also special sections on understanding how your child’s brain processes knowledge related to reading and math so you can help them get ready for success in school in a low-pressure way with no flashcards. Unfortunately, due to limitations in the system that hosted the courses, I don’t have a super easy to remember url for that course, but you can find links to both the courses YourParentingMojo.com/courses. And if you clicked through to the supporting your child’s learning in school course, from that page, you can download a free infographic which shows 11 easy things that you can do to help your child learn critical math concepts. Children who have these skills at the kindergarten or first grade level are really well set up for success and they’re not at all difficult things for you to teach if you know what they are. So go to your parenting Mojo.com forward slash courses for the link to supporting your child’s learning in school course to get that infographic. Jen: 01:00:04 Both courses are designed for parents of children age between about three and eight. You could take them on the earlier side if you really like to prepare in advance like I do, or if you think you’ll need extra time to put systems in place, like shifting careers to prepare for homeschooling or if you want to do them in the year before your child starts kindergarten, that would be a good time. Or if your child’s already in school, but you see signs of problems either in your own perception of school or in how the child interacts with the school system, then they could work for you at that point too. So if you’d like to learn more, head on over to YourHomeschoolingMojo.com for the quiz to assess your homeschooling readiness or YourParentingMojo.com/courses for the supporting your child’s learning in school course. Thanks as always for listening and I will catch you again in two weeks.